Stairs are the preferred solution for collective evacuation or access. All our staircases are produced from lightweight aluminum. Different layouts and types are available. When should you choose JOMY stairs? 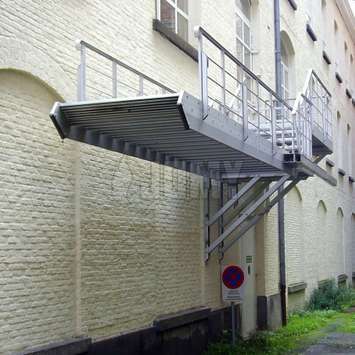 When you need to have a fire escape solution and a mean of collective access for your building, house, office, apartment block, hotel, student room, tall rise building, school, embassy, etc. Multiple stair accessories are available to make your stairs even more safe and burglar resistant. All JOMY staircases are produced from anodized aluminum profiles. 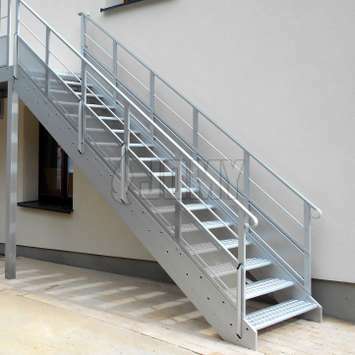 Our aluminium exterior stairs come in different layouts (inline, crossed, rectangular, etc.) and can have different support structures (suspended, self-supported).